First of all a little side not about the severe drop in posts lately. I've been consistently traveling for work for the last two months and haven't had much downtime to sit and focus on my blog. And while I can't speak for my cohort, Critic, I know he is up to his eyeballs with his own ball of wax. So I figured I need to start another feature to keep me somewhat on a schedule. As I've been immersed in Touhou Project for the last three months (which have been a Godsend with all the aforementioned travel), I figured a good jumping off point would be Touhou Tuesdays, where I will focus on one random Touhou Project work weather it be fanmade or official. 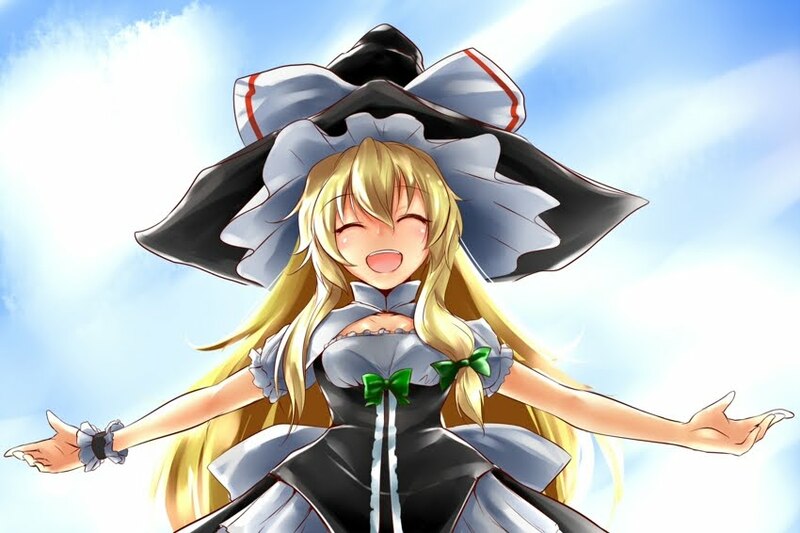 The game I want to focus on this time is a fanmade game called Marisa and Alice, or Marisa to Alice or MariAri. Personally I like MariAri, so it will be refereed to as such henceforth. Like a lot of fanmade Touhou games, MariAri takes a similar game and puts a Touhou coat of paint on it and tweaks it to make it something unique. So far that is what I have loved about a lot of Touhou fanwork games. I like old school platformers like Mario, Castlevania, and Megaman, but I'd like to play different version of those games that don't always star the same cast of characters. And as I love all the girls in Touhou Project, they make great substitutes for classic gaming mascots. 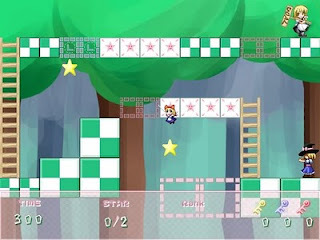 MariAri is a take on a Super Famicom game that never made it to the states called Mario and Wario. In that version of the game, Mario must make his way to Luigi through a maze set up by Wario. The catch is Mario can't see because he has a bucket stuck on his head. 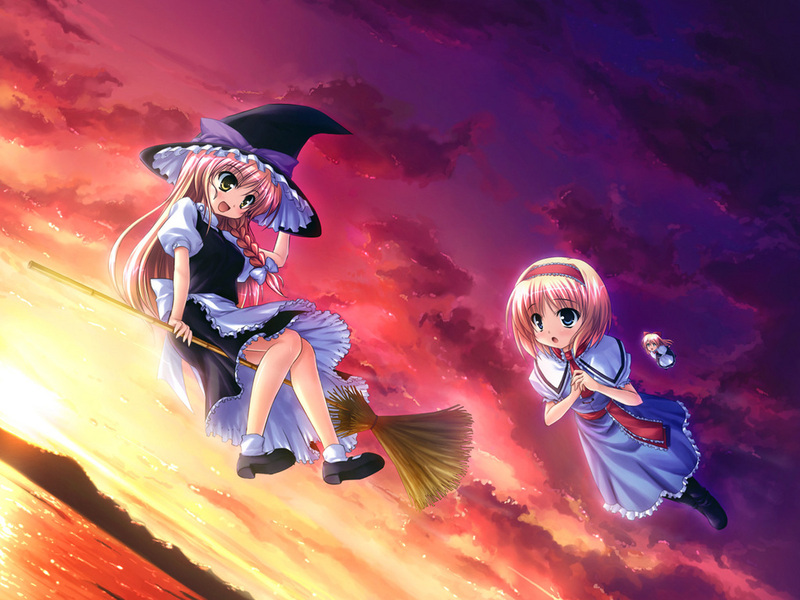 The premise for MariAri is similar, except you play as Alice, with Marisa's hat stuck on her head. Alice must enlist the help of her faithful doll to navigate through the maze to get to Marisa. The puzzles are all very challenging, but with trial and error are very fun and solvable. 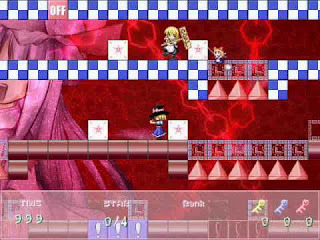 The game is played using only your mouse, where you click on Alice to point her in the right direction. She can't jump. All she can do is walk and fall off ledges. I highly recomend using a clean and responsive mouse, otherwise the later levels will leave you very frustrated. As I mentioned in my previous Touhou post, I'm an Alice x Marisa shipper, so of course I took a liking to this game's plot. 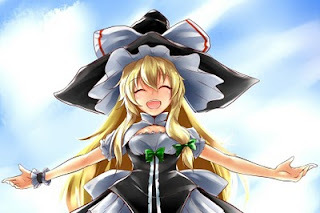 There is actually a fairly robust story here, and thanks to the ever active Touhou community an English patch is available (here) so that us westerners can enjoy the story. A good understanding of Touhou injokes might be required, but I think it is still a cute and humorous story if you don't know that much about the characters. Ultimately the game is great to just pick up and play a few levels when you are bored. This would be a fantastic iPhone game, but alas ZUN saw to making sure that would never happen. Also, Max Factory, please release an Alice Figma!